Welcome to the unofficial start of the summer season. We have a lot of exciting things planned for you in the coming months, including updates to our Marketing Best Practices and Website Design Guides, a great "Show-N-Tell" Lunch with Haley webinar featuring some of our most successful campaigns, and even a summer promotion on our services. Today, I hope you'll enjoy a Big Idea that's sure to get your sales engine revving. And if you're looking for more ideas to put your sales into high gear, call me at 1.888.696.2900. I'd love to brainstorm ideas with you. When you hear the word NASCAR, what do you think of? Talladega? Daytona? Names like Dale Earnhardt Jr. and Kyle Busch? Well, those cars and drivers wouldn't be much without their pit crews. 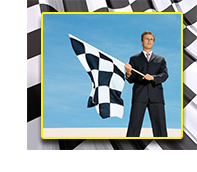 And just like NASCAR, your sales people need the right support team to beat the competition--and keep your company on track. Lunch with Haley webinars are a great way help your sales team improve their results. If you're looking for better ways to sell staffing, get everyone together, order a pizza and use our webinars as team-building events! Did you miss any of our Lunch with Haley webinars? What is your staffing firm worth? Call 888.696.2900 for the full list of webinars. SHOW and TELL with Haley Marketing. See the latest marketing ideas in the staffing industry! Check out our new Timeline design and all the tabs we've created. Follow our boards for some of the best ideas in marketing staffing. Join our Ask Haley group.